There are more women in the Senate than ever (25), and in six states – Arizona, California, Minnesota, Nevada, New Hampshire and Washington – both senators are women, up from three states in the previous Senate. These gains have been relatively recent, however. The House has seen slow but steady growth in the number of female members since the 1920s. Growth in the Senate has been slower: The Senate did not have more than three women serving at any point until the 102nd Congress, which began in 1991. And the share of women in Congress remains far below the share of women in the country as a whole (24% vs. 51%). 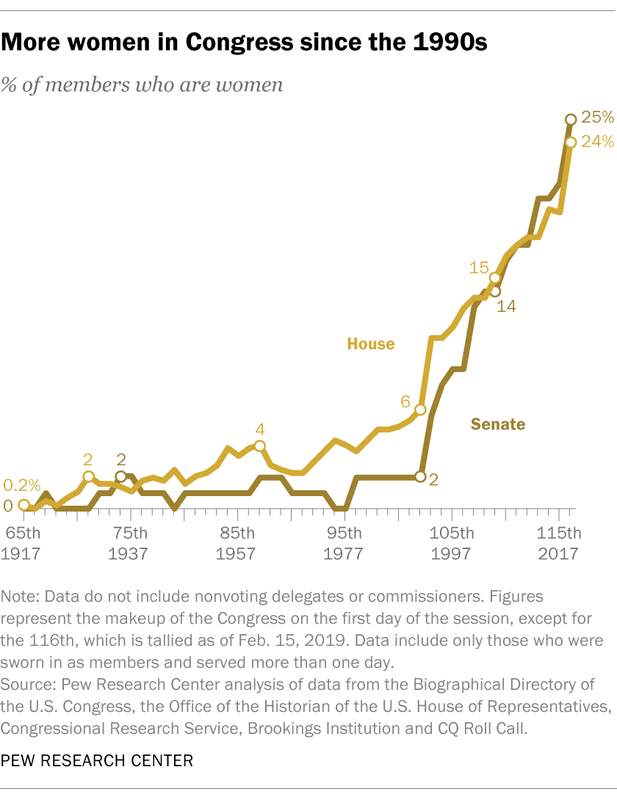 3The share of immigrants in Congress has ticked up but remains well below historical highs. There are 14 foreign-born lawmakers in the 116th Congress, including 13 in the House and just one in the Senate: Mazie Hirono, a Hawaii Democrat who was born in Japan. 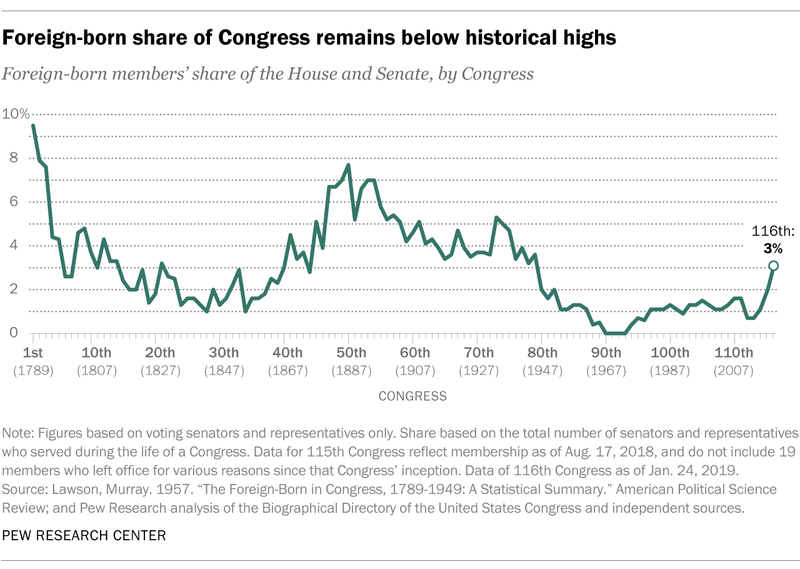 These lawmakers account for 3% of the overall Congress, a small increase from the 115th Congress but far below the shares recorded in much earlier Congresses. In the 50th Congress of 1887-89, for example, 8% of members were born abroad. The current share of foreign-born lawmakers in Congress is also far below the foreign-born share of the U.S. as a whole, which was 13.6% as of 2017. While the number of foreign-born lawmakers in the current Congress is small, many members have parents who were born in another country. 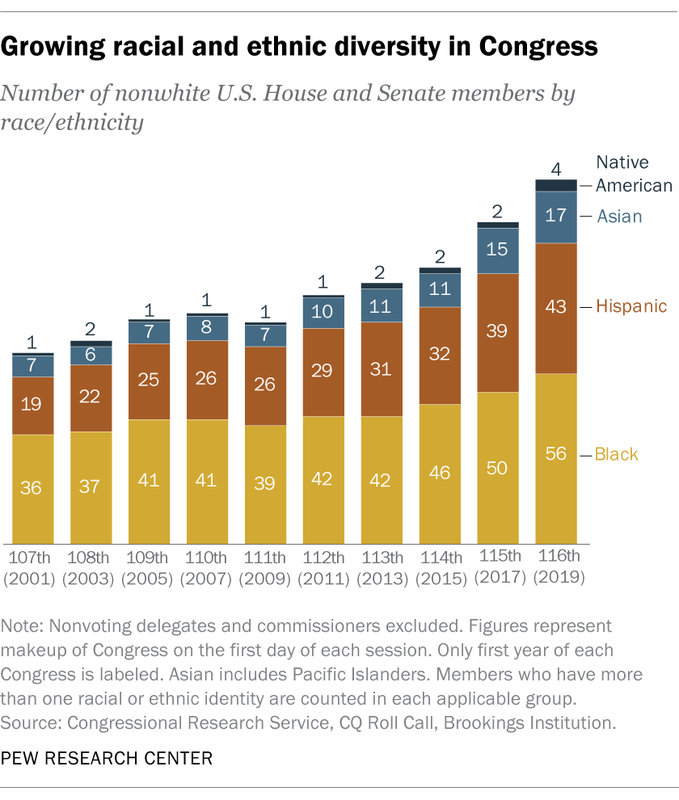 Together, immigrants and the children of immigrants account for at least 13% of the new Congress, about the same share as in the last Congress (12%). While the number and share of veterans in Congress overall have decreased, the newly elected freshman class boasts the largest number of veterans in a decade (19). 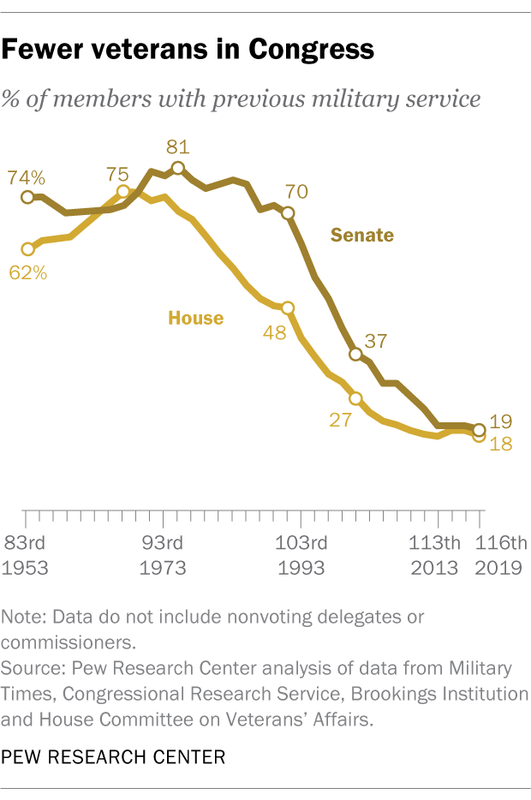 Looking at the longer term, there has been a dramatic decrease in members of Congress with military experience since the late 20th century. Between 1965 and 1975, at least 70% of lawmakers in each legislative chamber had military experience. The share of members with military experience peaked at 75% in 1967 for the House and at 81% in 1975 for the Senate. While relatively few members of Congress today have military experience, an even smaller share of Americans do. In 2016, just 7% of U.S. adults had military experience versus 18% in 1980, not long after the end of the military draft era. 5 Nearly all members of Congress now have college degrees. The share of representatives and senators with college degrees has steadily increased over time. In the 116th Congress, 96% of House members and all senators have a bachelor’s degree or higher. In the 79th Congress (1945-47), by comparison, 56% of House members and 75% of senators had degrees. The educational attainment of Congress far outpaces that of the overall U.S. population. In 2017, around a third (34%) of American adults ages 25 and older said they had completed a bachelor’s degree or more, according to U.S. Census Bureau data. 6Congress has become slightly more religiously diverse over time. The current Congress includes the first two Muslim women ever to serve in the House and has the fewest Christians (471) in 11 Congresses analyzed by Pew Research Center dating back to 1961. 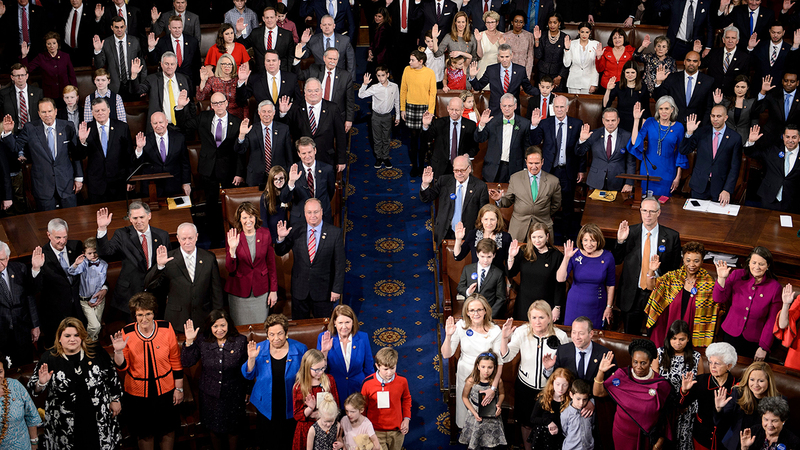 Despite this decline, Christians are still overrepresented in Congress in proportion to their share of the public: Nearly nine-in-ten congressional members are Christian (88%), compared with 71% of U.S. adults overall. 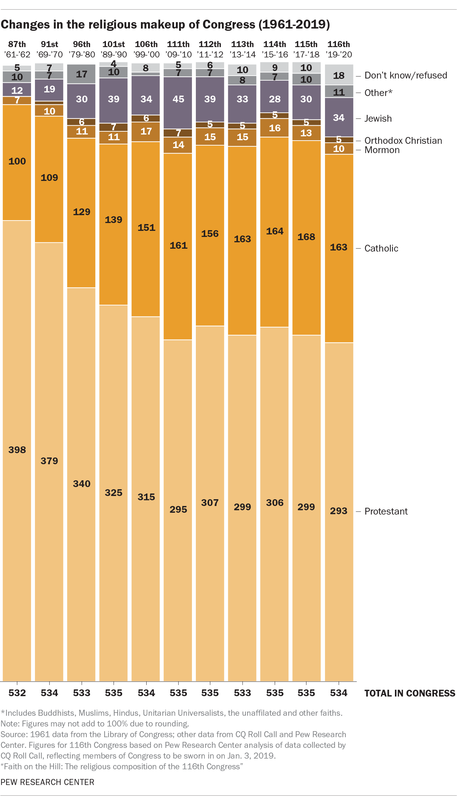 By contrast, religious “nones” are underrepresented in Congress in comparison with the U.S. population. While 23% of Americans say they are atheist, agnostic or “nothing in particular,” just one congressional member – Sen. Kyrsten Sinema, D-Ariz. – says she is religiously unaffiliated. Correction: This post has been updated to include the correct share of nonwhites in the United States. Note: This is an update to a post originally published on Feb. 2, 2017.